What's new in mp3Tag Pro 9.1? [!] Files in the main window can now be sorted by any column. In mp3Tag Pro 9.1 such files are additionally sorted by track#. [+] Added support for some new fields, like rating and language. 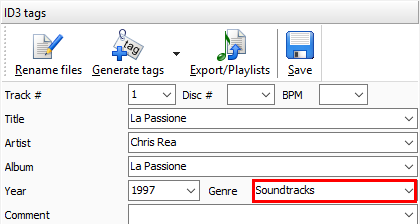 If such fields are available in the existing tags, they will be preserved by mp3Tag Pro. The new version of mp3Tag Pro reads more fields of existing tags, which allows saving their values when you update tags. For example, previous versions would clear your rating (shown as stars in Windows) if you updated ID3 tags. mp3Tag Pro 9.1 preserves rating and other fields by reading and re-saving them. [*] Changed priority for lyrics search. 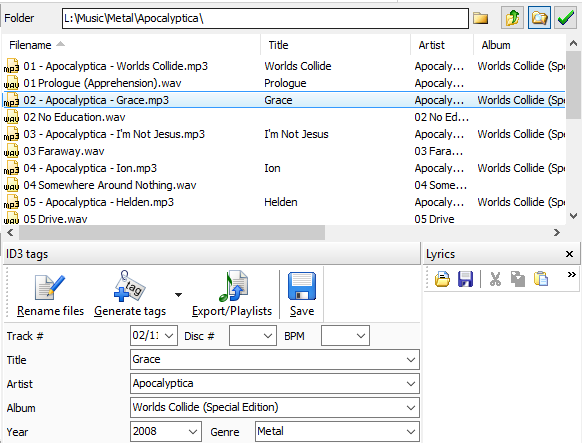 mp3Tag Pro can find and download lyrics in several ways. 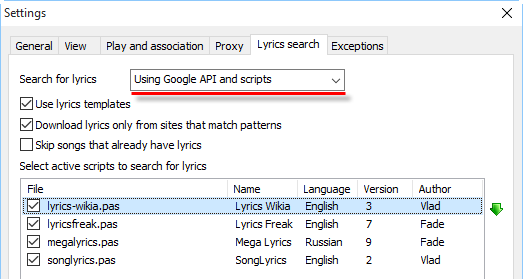 In mp3Tag Pro 9.1, priority of lyrics search was adjusted to improve quality and speed. [-] Fixed deleting information from the comment field when updating tags for several MP3 files. In certain situations mp3Tag Pro 9.0 might delete information from the comment field, if several files were updated at the same time. This problem was fixed in mp3Tag Pro 9.1.
mp3Tag Pro 9.0 could fail to show information from the "Genre" field. This was fixed in mp3Tag Pro 9.1. [-] Fixed updating the main list when the user updates tags file by file manually. With mp3Tag Pro you can manually edit information from tags, either for each file individually, or for a group of files at once. When updating files one by one, you could experience a problem in mp3Tag Pro 9.0 when the main list of files wasn't displayed properly. mp3Tag Pro 9.1 fixes this issue. [-] Fixed saving WAV tags when working with mixed groups of files (WAV + MP3). mp3Tag Pro 9.0 might fail to save WAV files, if you worked with a group of mixed formats (for example, MP3 + WAV), so you had to separate WAV from other formats. This problem was fixed in mp3Tag Pro 9.1. [-] Fixed the "Cannot focus a disabled or invisible window" error. In a number of scenarios mp3Tag Pro 9.0 might show a "Cannot focus a disabled or invisible window" error, which prevented any further editing within the session. The program had to be restarted. This error was fixed mp3Tag Pro 9.1. As usual, there are other small improvements and bug fixes in mp3Tag Pro 9.1.